Alpine Valley Resort features the rolling terrain common to the Kettle Moraine area. Elevation changes throughout the course will challenge every type of player. The courses offer the challenge of mature trees, water, bunkers and undulating green. Alpine will be a true test but also an enjoyable experience. There are 27 holes of golf; a great place to have your next outing. With everything you need from the Pro-shop to banquet facilities. From the Scenic beauty of the course to the full service banquet facilities, Alpine will be happy to host your wedding day ceremony and reception. Alpine can effortlessly host any function from 20 to 200 people. 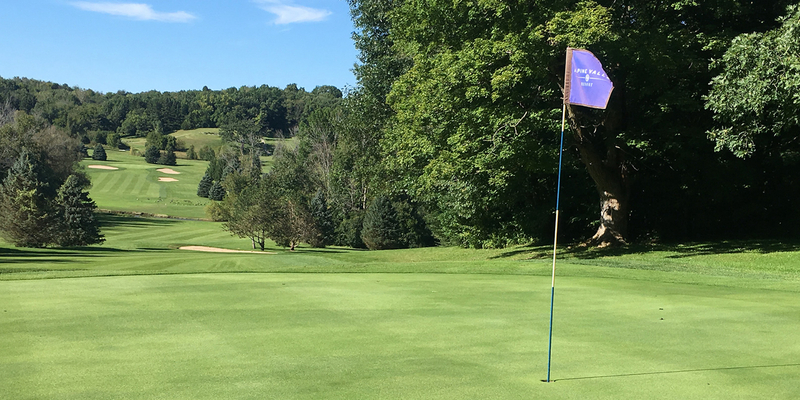 Located 1/2 mile from the intersection of Highways 120 and D, on Highway D.
Alpine Valley Resort has availability for new leagues to come enjoy our beautiful course, please contact Pro Shop Manager Shyanne Thompson if your league is in need of a new home course, or your traveling league is in search of additional courses to play. Contact Alpine Valley Resort at 262-642-3934 for more information and details on holding a golf outing at the course. Let us help make your day truly special! Your wedding day may be the most important day in your life, so you should choose a professional who is committed to quality and assists you in the planning of your special day. Alpine Valley can accommodate up to 200 people, and our facilities are available on a seasonal basis during the months of Mid-April through October. Contact Alpine Valley Resort at 262-642-3934. Contact Alpine Valley Resort at 262-642-3934 for onsite or nearby dining options. This profile was last updated on 04/28/2018 and has been viewed 62,008 times.